Unroll and spread 1 can crescent rolls on bottom of un-greased pan / 9×13 pan. Combine softened cream cheese, sugar, and vanilla. Spread mixture over crescent rolls. Unroll and spread remaining crescent rolls over mixture. 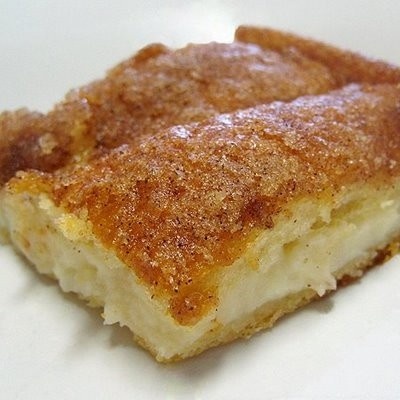 Spread melted butter over the top and sprinkle with cinnamon and sugar. Bake at 350 degrees for 20-30 minutes. I prefer to serve it at room temperature, but I would never leave it out overnight or anything. Cream cheese is still dairy and I wouldn’t want to risk this going bad!